You will be given a reference e-book to read which has 260 pages And the test will be based on that e-book , you can take final test within 1 year of purchase. Enrolling in a respiratory care certification program especially that which is now offered by Brainmeasures is one of the best things that you can do especially if you want to fully equip yourself with all information relevant to the human respiratory system. The respiratory care course which you can now access at Brainmeasures is your ticket towards understanding how the respiratory system works and the many factors that may cause it to malfunction. This certification course provides a well-detailed respiratory care training which makes it a point to explain in detail the many things that you can do to improve the ability of a patient’s respiratory system to function. It covers the medical procedures and treatments that are effective in offering constant respiratory function to patients who are suffering from breathing problems. As soon as you complete your respiratory care certification course and finally receive your certificate, you will become more familiar about the basics of monitoring the respiratory system of patient and master all the procedures involved in performing diagnostics tests. How does the Acute Physiology and Chronic Health Evaluation works? 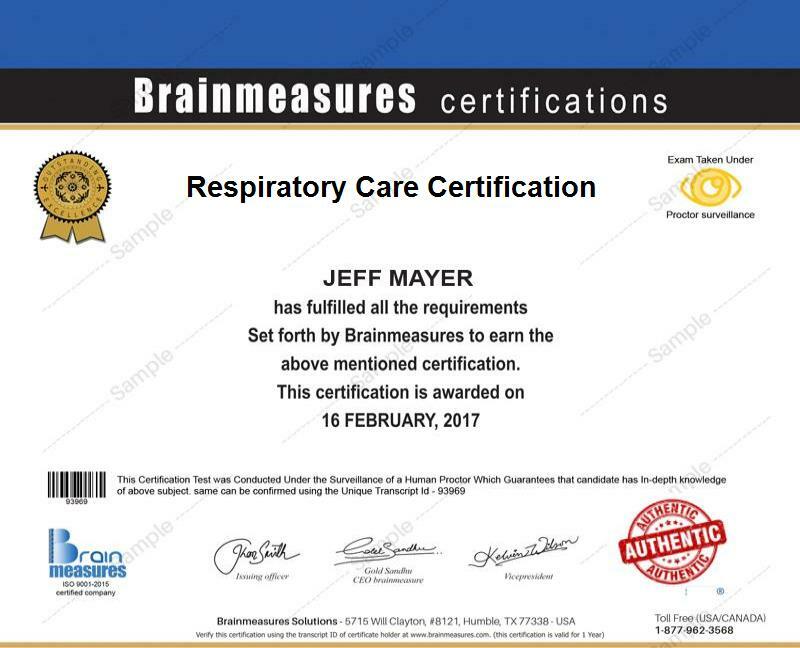 The respiratory care certification program which you can now easily access at Brainmeasures is extremely useful to a wide range of individuals especially those who have a great passion in helping others improve their respiratory health. It targets any experienced and aspiring respiratory care experts and therapists who aim to increase the level of their knowledge and skills in providing the highest level and the most sought after respiratory care services to their patients. Completing a respiratory care certification course is also a huge help for you especially if you are aspiring to increase the level of your income. You can use your respiratory care certification to work as a respiratory care therapist which will allow you to earn around $35,000 to $68,000 annually. You can also work as a respiratory care consultant which can offer you an annual salary of around $57,000 to $97,000. Working as a respiratory care manager is even more profitable because this will let you receive a salary within the range of $89,000 to $107,000 per year.